Are you trying to tell me that I should keep my obscure hobbies out of other peoples' threads? vnstat is really useful to get an overview of the network volume use on a particular computer. For more precise information of overall use you need to set up something where your router pushes stats to your computer or your computer retrieves them from your router. What is the compose key? Ctrl, Alt, Shift, Win/Super? Something else? And where's the beginning? I mean, for us, mere mortals that don't have a clue about what are you saying? Why should I install Linux operative system in the first place? What are the benefits over windows? Why do you use mysterious terms no one uses? Doesn't Linux gives you much more work and much less available software? Courageous Windows users would like to know. Compose key is just to provide another layer of Alt Gr function? I tried right now, and compose seems to do nothing useful for me. But I sure would like to map Caps Lock function to a key combination rather than a single key in a nasty place. Something like this would work https://donatstudios.com/assets/43/hhkb.png even though I prefer an additional numbers keypad too. Compose key is just to provide another layer of Alt Gr function? I tried right now, and compose seems to do nothing useful for me. It overlaps with Alt Gr, but because it can take multiple keys as input it's significantly more versatile. But speaking of the last one, Alt Gr + what produces ™? Alt Gr + what produces ¥? How do you type ±? Why does z lead to æ and Æ? It makes certain things simpler and more intuitive. Compose, t, m = ™; Compose, =, y = ¥; Compose, +, - = ±; Compose, a, e = æ. If you're happy with Windows, you can safely stick with it. If you're curious, I'd recommend trying a LiveCD of one or all of the following. NB A LiveCD means no installation (and thus no risk) is necessary to try it out. However, I personally use Xubuntu (review) and Debian Xfce. More work--I'd say only if you want it to. Less available software, probably, but most software is crap anyway. I was already using Filezilla, Inkscape, Pidgin, LibreOffice (as OpenOffice), SciTE, Workrave, Opera, and several other multi-platform programs, so in my case making the final switch was fairly uneventful. It's all Unix terminology. Most of it predates even MS-DOS. Benefits are personal. One benefit in my case is that Windows doesn't exactly make it easy to put e.g. all your user data on one particular partition or HDD, but most Linux distros tend to set it up that way by default. * It'll mean searching for r-base in a graphical package manager or typing sudo apt-get install r-base in a terminal. Ah, yes. Here I see the point. However, for me Alt Gr and Alt Gr+Shift do everything needed. For example, on my keyboard © is produced by Alt Gr+Shift+c. Alt Gr+c produces ¢. Alt Gr + what produces ™? Alt Gr + what produces ¥? How do you type ±? Why does z lead to æ and Æ? I have Estonian layout. In my case Alt Gr+a produces æ and Alt Gr+Shift+a produces Æ. But I agree that the compose key can be useful to access more characters or the same characters in a customised way. I can corroborate everything Frenzie says about switch from Win to Linux, though we shouldn't be trusted so much, as we are techie-minded above average. On my part, I'd add Manjaro (Xfce) and Mageia (KDE) among LiveDVD's to try out. To me it feels Xfce is the best desktop environment to make the switch. Office software is vital to my work, but it has turned out that Libreoffice/Openoffice is a sufficient replacement, even professionally. Wifi works, attached storage works, Flash works, sound and video works, DVD's work (for Disney DVD's I had to launch a script to make them work, but the script was already included in Mint, Ubuntu, and Manjaro, so no problem), printers work (particularly if HP). What more do you want? On my keyboard layout the answers are different (and ± can't be typed at all I believe), but on the whole I find it a more elegant solution than switching keyboard layouts or customizing them on the third (Alt Gr) level. In any case, you caught me somewhat unprepared. Nice, I'll pay close attention at those links you provided. Thanks. Currently I need nothing specific for professional needs. Decided that profession must adapt to me, not me to the profession. Besides what you mentioned, I just need an image editing software, but I'm sure that exists. Indeed - Gimp http://www.youtube.com/watch?v=8LmW5ndnEqw I haven't figured out this Gimp thing myself. I only need image viewing and some scissor functions, which are provided by much simpler programs. To me it feels Xfce is the best desktop environment to make the switch. However, Xfce (and Cinnamon) are more like classic Windows. I'd argue it's simply an extremely effective paradigm, but people looking for something else might at least initially be more pleased with Unity. However, Xfce (and Cinnamon) are more like classic Windows. This is not "however". It's exactly the idea, to provide a familiar user experience even though the underlying opsys is different. All people for whom I am adminning in my small hobby manner appreciate the familiarity of the experience. I try to make the switch for them so that the most visible change is that they don't see anti-virus programs any more. ...people looking for something else might at least initially be more pleased with Unity. Unity is Mac-ish (I suppose - I have seen Macs only in shops) and I think its utility is only in appealing to those who switch from a Mac. I don't know anyone besides myself who would be interested in different experiences. In the graphical section, KDE provides the best "different" experience (kind of). Otherwise the only truly different experience is to do everything in the console. There's also a good "middle path" provided by Openbox. Dwm and the likes are too barebones, only good to shoot up multiple terminal windows, which can just as well be done with tmux or 'screen' in the console. In the graphical section, KDE provides the best "different" experience (kind of). But KDE is the most like Windows (or can be). With a few quick settings it can be as different as Unity or practically a clone of Windows. In any case, know your audience. I'm just saying that Unity, unlike Gnome Shell, is actually functional. Unity is Mac-ish (I suppose - I have seen Macs only in shops) and I think its utility is only in appealing to those who switch from a Mac. Or to those who'd switch to a Mac but don't feel like buying one of those overpriced computers? Perhaps. It does follow its paradigm quite closely, from the window buttons to the global menu to the way task switching works (Alt+Tab for applications; Alt+` for windows within applications). Dwm and the likes are too barebones, only good to shoot up multiple terminal windows, which can just as well be done with tmux or 'screen'. Otherwise the only truly different experience is to do everything in the console. Not necessarily. I can actually add Cygwin to the list of programs I used on Windows (with PuTTYcyg) because it offered a significantly more powerful shell than Windows. These days that's no longer true because of PowerShell, although the fact that the GNU utils in many ways work better in a Unix-like environment remains, but back during the Windows 9x days PowerShell was still a long way off. There used to be a few window managers that look like windows 95, Mac OS 9, AmigaOS etc., many of them fvwm hacks ( which itself is a Motif lookalike... ). After years of playing with KDE, xfce etc. I ended up with just WindowMaker again. Xfce 4.8 and 4.10 made large strides in improving the user experience. It's now closer to where Gnome 2 was in 2010. In any case, do you have any tips for using WindowMaker? Or screenshots of your setup? That reminds me, I promised to share a screenshot of mine. 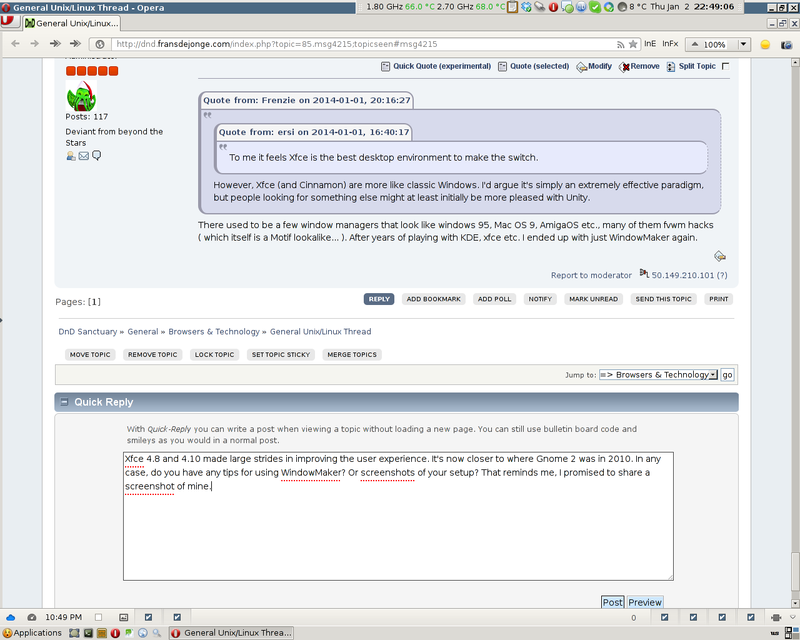 Xfce 4.8 and 4.10 made large strides in improving the user experience. It's now closer to where Gnome 2 was in 2010. Yeah, I saw that but didn't have much time to play with anything lately. In any case, do you have any tips for using WindowMaker? There isn't really much that's not blindingly obvious ( then again, I'm doing this since the mid 1990s so my judgement may be off ) - it's just a window manager that has NeXT-like application icons that you can stick on the dock or the clip. Works with most applications, notable exceptions are firefox and opera, mostly because they're started by scripts, not the actual binary that then talks to the window manager. For those just sticking the icon on the dock won't work since it will try to start things like xul-runner instead of firefox's startup script, but that's trivial to fix. Or screenshots of your setup? Fairly old school, just a bunch of xterms, pidgin, firefox, bluefish abused for hacking C code, evince showing some hardware docs, balsa ( I got fed up with sylpheed / claws taking bloody ages working over IMAP, balsa was just the first I ran into that doesn't have this problem ), amarok, gkrellm. One strange thing I noticed this morning is that it seems KDE communicates better with user than Gnome or Cinnamon. I tried to change the Firefox panel icon in Cinnamon to a custom one, and Firefox disappeared from the panel with no explanation. When I tried to do so in KDE, it at least told that for some reason it couldn't find Firefox and I was able to show it where the browser was ( in /usr/bin as usual...IDK ) I need a DE that more reliably tells me what's wrong if strange things like that happen. Meanwhile, the GTK 2 DEs (Mate and XFCE) had no trouble finding Firefox at all. Apparently not all 34-year-old code is hard to compile today. Plain C is simple. Try to compile something like KDE1 on a halfway modern compiler though. Oh, and we have a new Linux World Map.